3 Years Later, ready to do it all over again! Its been exactly 3 years since the start of the 2010 World Equestrian Games and I am blown away by how quickly that time seems to have gone by. This December will mark 8 years since the announcement that we had won the right to host the Games. A lot of hard work by a lot of dedicated people occurred between that announcement and this date 3 years ago. I played a small part during that time as well as volunteering for 12 of the 16 days of the Games and was/am proud of my participation and humbled by the experience all at the same time. Of course I am ready to do it all over again and as much as I have talked about the possibility of us getting it back, most time I felt a bit alone in that endeavor. I do know that it took a lot out of a lot of people but I have always believed after some time the true positives of us hosting the Games would be what people remembered and that a spark would ignite the fire again to seek them once more. This week I believe that happened, Mark Green of The Lane Report wrote a piece on the idea of Kentucky getting the Games back for 2018, which of course is sooner then even I dreamed anybody would suggest. First let me say, part of my excitement, and my wife can attest that I was actually excited after reading Mark’s article, was just knowing I wasn’t totally alone in believing that I would live to see the Games back in Kentucky again, and I believe that to the point of knowing it in my heart and soul. What takes the excitement even to a higher level is that this was an article published by The Lane Report which by all standards I have seen over the years is a well read and well considered publication both in and out of the Commonwealth. Now I have to assume they, meaning the editors who had to approve Mark’s article, had to feel it had some merit and interest to their readership because its a publication that likes and needs to be taken seriously to stay in business because there is a significant segment of the business community in this area that looks to The Lane Report for some level of guidance in how and where business in this area is going. Obviously more then a few business leaders read this article and stopped to ponder the implications of what if we did get the Games back in 2018. I highly suspect those editors at The Lane Report are well aware of the implications of such pondering because successful business leaders will tell you that a key to being successfully is having a plan that runs 5 to 1o years out in the future and being prepared to take advantage of opportunities when they present themselves. I know we may not get the 2018 Games, but my plans go out much farther then that so I won’t be disappointed if they are not here in 2018 because I will know I am still that much closer to seeing them back, One Day! 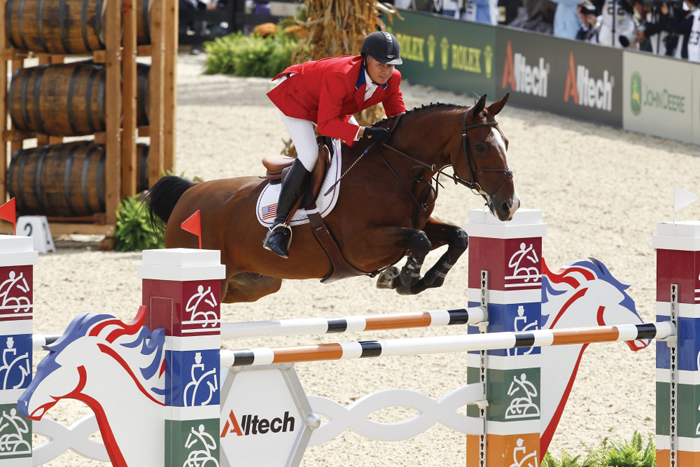 Will the 2018 World Equestrian Games jump back into Kentucky? Eight countries initially indicated an interest in bidding for the 2018 FEI World Equestrian Games, according to recent world news reports. The countries indicating interest were Canada, Morocco, Austria, the U.S.A., Hungary, Australia, Russia and Sweden. The 2010 World Equestrian Games were conducted in Kentucky. Australian, Swedish and Russian applications were withdrawn prior to the start of the official bid process, leaving five bidders for the 2018 games – Wellington, Fla., USA; Rabat, Morocco; Bromont, Quebec, Canada; Budapest, Hungary; and Vienna, Austria. For various reasons, all bidders but Bromont, Quebec, elected to withdraw from the final bidding process. In July, the FEI rejected the Bromont bid and announced it would reopen the bidding process because Bromont did not provide the necessary financial guarantees on or before the day it was due to be awarded the bid for the 2018 World Games. Because the FEI will be reopening the bid for the 2018 World Games, it seems appropriate for Kentucky to consider indicating its interest in hosting the 2018 Games. • In the autumn of 2010 (FY11), the Horse Park hosted the 2010 Alltech FEI World Equestrian Games. The 16 days of the games alone had a total economic impact of $201.5 million, including $18.4 million in state taxes, according to a report commissioned by the Kentucky Tourism, Arts and Heritage Cabinet and conducted by Certec Inc.
• For FY11 as a whole – excluding the 2010 Games – the cabinet calculated the park’s economic impact to be $179 million, generating $14.2 million in taxes. As a result of combined events and activities held at the Kentucky Horse Park during FY11, $32.6 million in tax revenues were added to the general fund of the Commonwealth of Kentucky. • The total attendance at the 2010 Games was 507,000. • On four days of the 2010 Games, the attendance was more than 40,000 persons. • 96 percent of residents felt hosting the 2010 event was beneficial to Kentucky. • 74 percent of international visitors stated they were likely to return to Kentucky as a result of the World Games. • TV channels around the world aired 1,556 broadcasts. Total broadcast time was 474 hours. • 38 hours were broadcast in the United States, of which 20 were live. All research data seem to indicate hosting the 2018 FEI World Equestrian Games in Kentucky would be a winning and financially successful idea for the FEI and Kentucky. Due to the quality facilities already in place at the Kentucky Horse Park, the financial investment and risk of hosting the 2018 World Games would likely be greatly reduced. I have posted this from the Lane Report in its entirety, original article is by Mark Green and can be found here . Lexington, Ky. Kentucky’s equine industry had a total economic impact of almost $3 billion and generated 40,665 jobs last year, according to the 2012 Kentucky Equine Survey. The tax contribution of the equine industry to Kentucky was approximately $134 million. TheUK College of Agriculture, Food and Environment’s Ag Equine Programs and Kentucky Horse Council, in conjunction with the U.S. Department of Agriculture National Agricultural Statistics Service, today released the economic impact figures from the 2012 Kentucky Equine Survey, a comprehensive statewide survey of all breeds of horses, ponies, donkeys and mules. This was the first such wide-ranging study of Kentucky’s equine industry since 1977 and the first-ever detailed economic impact study about Kentucky’s equine industry. “We are pleased to announce the long-awaited results from the economic impact study. The estimates underscore the continued significance of the equine industry to the commonwealth, and they show that each segment of the industry contributes in important ways to the economy as well as to the rich cultural fabric of Kentucky,” said Stowe, who is also associate professor in agricultural economics. When looking more specifically at each sector’s estimated impact, breeding had the highest employment figure of 16,198, an output of $710 million and a value-added impact of $333 million. Racing had the highest output impact at $1.28 billion, with a figure of 6,251 in employment and $601 million in value-added impact. Competition figures included 2,708 in employment, $635 million in output and $297 million in value-added impact. Recreation had 594 in employment, $166 million in output and $78 million in value-added impact. Other, which accounts for operations such as therapeutic riding facilities and those where horses are used for work, had an employment figure of 14,914, a $194 million output and a $91 million value-added impact. “The College of Agriculture, Food and Environment is proud of this project because first and foremost, it represents the best available methods of surveying that universities and government can provide. But the most compelling aspect of this study is that our future policy discussions can be guided by solid numbers. We thank the Kentucky Horse Council and the Kentucky Agricultural Development Board as well as our numerous donors, for recognizing how much the Horse Capital of the World needs a sound foundation for policy decisions,” said Nancy Cox, associate dean for research in UK’s College of Agriculture, Food and Environment, Kentucky Agricultural Experiment Station director and administrative leader for UK Ag Equine Programs. The first phase of the study was released in January and measured Kentucky’s equine and asset inventory. That portion of the study found that the state is home to 242,400 horses and the total value of Kentucky’s equine and equine-related assets is estimated at $23.4 billion. The survey’s results identified 35,000 equine operations and 1.1 million acres devoted to equine use. The first phase also found that equine-related expenditures by equine operations totaled about $1.2 billion. Capital expenditures by equine operations, including the purchase of equines, real estate and improvements and equipment, were estimated to be $337 million. Operating expenditures, including expenses paid for boarding, feed, bedding, veterinary, supplies, farrier services, breeding, maintenance and repair, insurance premiums, utilities and fuel, taxes, rent and/or lease, fees and payments, shipping and travel, training and other fees, totaled $839 million. Notably, 77 percent of these operating expenses were spent in Kentucky. The study determined that 56 percent of Kentucky’s equine operations are farms or ranches and 30 percent are for personal use, while 3 percent are boarding, training or riding facilities. Breeding operations accounted for 2 percent. “The data from this study will benefit the state in many ways. We have already made use of the results at two regional horsemen’s caucuses held in areas with identified concentrations of equine populations. We are looking forward to at least three additional regional horsemen’s caucuses based on this data in 2014,” said Anna Zinkhon, Kentucky Horse Council Board president. As might be expected, there is a concentration of horses in the Bluegrass area of Central Kentucky but there are also other areas of the state with significant concentrations of equine. According to the report, thetop 10 counties in Kentucky with equine acres were Fayette (89,000), Bourbon (48,700), Woodford (44,200), Scott (26,600), Grant (22,000), Oldham (21,000), Grayson (18,900), Warren (18,700), Boone (16,500) and Carter (16,400). More detailed county information can be found in the full report online. Funding for the project was provided by the Kentucky Agricultural Development Fund, along with UK’s College of Agriculture, Food and Environment, the Kentucky Horse Council and numerous other industry organizations and individuals, a complete listing of which can be found on the project’s website. More information about the 2012 Kentucky Equine Survey, including a copy of the final report and appendices, can be found at http://www2.ca.uky.edu/equine/kyequinesurvey. Bringing WEG back to Kentucky. By now I would assume anyone who has read my blog from over the last almost 8 years, can guess I have a high degree of interest in seeing the World Equestrian Games back in Kentucky again. Now after what I heard last Saturday at the Kentucky State Fair I think I need to re-emphasize that. It was the Saturday Night of the World’s Championship Horse Show, which is the big night and its not unusual for a sitting Governor to be there to present an award, this year was a little different. The Governor seemed to be doing a stump speech, though not really sure why, but he was going on about how Kentucky is the Horse Capital of the World and how much money this particular week long show brought in. Now let me stop before anyone thinks my intention is to bash the Governor, absolutely not, I like Steve Beshear and the First Lady Jane Beshear who is quite an accomplished horse person in her own right. I will go as far as to say I voted for Governor Beshear, not saying I agree with all his policy positions but certainly think he provides a balance and direction to the Commonwealth that has helped it to weather the economic storm of the last 7 years. I just wish that as the Governor he would openly say that he would like to see the World Equestrian Games back in Kentucky again and at least set the ball in motion considering he realizes how important it for Kentucky that we are the Horse Capital of the World. So the point I want to drive home is, we are the Horse Capital of the World and we should make it known that we desire to hold the World Equestrian Games every so many cycles, in my opinion, no more then every 16 years with an average of 12, meaning sometimes 8 years and sometimes 16 years. To me it seems a no brainer, there were significant capital improvements made to the Kentucky Horse Park and the infrastructure surrounding it. Those type of capital improvements have a life span just like anything does, I would argue they have a half-life of 16 years meaning if we hosted the Games again by 2026 most of that infrastructure should still be usable having been maintained as part of the standard ops of the Horse Park. Now, I would certainly love to have comments from Architects and Engineers as well as City Planners on where I am right and wrong in that generalization but I am more right that wrong for the sake of my argument, and that argument isn’t whether I am crazy or not, that was settled a long time ago in regards to this. In some ways its no longer an argument on whether the Games are coming back to Kentucky, I will find a way to get them back here because I do believe with all my soul that it is very important to Kentucky and maybe even our responsibility as the Horse Capital of the World to be part of the global rotation that holds the Games, and that is another topic for another post, the idea that there should be set of established host locations, but again, topic for another post.